We just got our passports; what a gift. A great way to feel more sophisticated, ready to travel at the drop of a hat, and in our cases, more American. Travel does that to us. As wonderful as we find visiting other countries, we return that much more in awe of our system of government. A case in point. Just after graduating from College, I took a trip to visit a friend who was with the Peace Corps in West Africa. Three weeks in the bush, while no picnic, was something that most tourists don’t get to do and which I will never forget. A couple of moments do stand out, I “shook the hand of the mango man as he met me at the border…” for a true Jimmy Buffet moment. Then there was the incident at the Côte d’Ivoire airport (this was back in the late 1980’s) and the kindness of a Canadian gentleman who got me onto an Air France plane when more diplomatic means failed. Oh, and the time our bush taxi was stopped at a checkpoint in-country and the boy with a machine gun demanded my passport. I feigned to not understand French, took off my sunglasses, held my passport through the window and didn’t let go. We were eventually waved through when an older guard misidentified me as a diplomat. 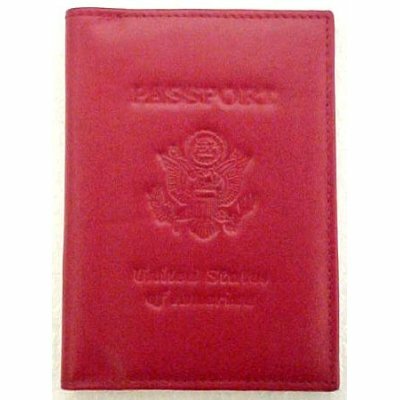 You see, my passport was wrapped in a leather passport cover like the one above. Highly recommended and very elegant if traveling this summer. This entry was posted in Living and tagged accessories, Living, travel. Bookmark the permalink. A passport is a very liberating document, a possession that every American should acquire. Just the act of submitting an application is mind-altering. I was so pleased that my 83-year old mother just got a new passport. When I asked if she was planning to go somewhere, she said that she didn’t want to not be able to go because her passport was out of date. Good on ya, Mom! My feelings exactly, Fairfax. I wish I could send the plane for her.